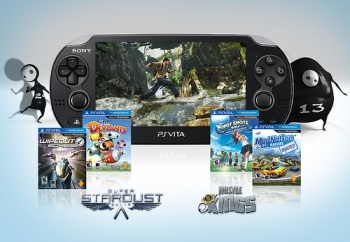 Sony Could Sell 12.4 Million Vitas "With A Price Cut"
If Sony's willing to cut the Vita's base price by $70, it might be able to sell over 12 million units this year. Now that the PlayStation Vita's finally launched here in North America, everyone's paying close attention to see how the device sells. On one side, you have people who are claiming Via developers are already jumping ship thanks to low sales numbers in Japan. On the other, you have folks claiming the device could sell up to 12.5 million units this year, "provided it gets a price cut." That estimate comes from research group Strategy Analytics, which came up with this figure after it plugged in a price of $180. That's a pretty steep cut from the current price (which starts at $250 and goes up from there), but Strategy Analytics claims that hardware and software sales might be able to bring Sony as much as $2.2 billion. "In the time of austerity, consumers are considerably sensitive to prices, and Nintendo proved that a price cut can save a product. "Sony now is experiencing the same story in Japan. Sales of the Wi-Fi version of PlayStation Vita at $249 initially exploded, selling more than 300,000 units in the first week of release. But the new console is barely moving 20,000 units per week in its home market after all the hard-core fans made their purchases, mirroring the experience of the Nintendo 3DS." Wu also noted that Sony's main challenges for the Vita include the fact that the 3G model comes with a $50 premium and additional data plans will turn off many customers, as well as creating unique content that's exclusive to the Vita. The analyst's estimates certainly sound reasonable, but we'll have to wait and see if Sony's able to find the "holy grail" price point and unique content in order to transform the Vita into a gold mine.